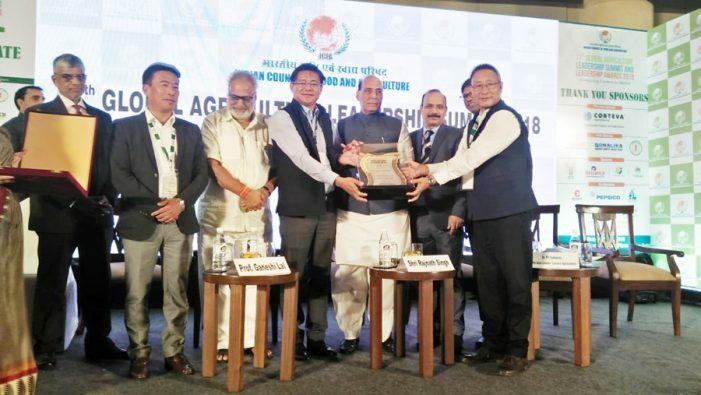 Nagaland received the ‘Best Horticulture State’ award at the 11th Global Agriculture Summit 2018 held in New Delhi on Thursday. On behalf of the State Government, Horticulture Department adviser and legislator Mhathung Yanthan, along with Horticulture principal secretary M K Mero, Horticulture director Dr Elithung Lotha, New Delhi Nagaland House deputy resident commissioner Kethosituo Sekhose, planning department officer on special duty Thomas Thailu and New Delhi Nagaland House PRO Kuolie Mere, received the award from Union Home Minister Rajnath Singh. Organised by Indian Council of Food and Agriculture, Rajnath Singh and Odisha Governor Ganeshi Lal attended the summit as chief guest and guest of honour respectively. The Best Fishers State, Best Animal Husbandry State and Best Horticulture State awards were also given away. Further, awards were given away in 20 other categories like international leadership, Africa leadership, research leadership, academic leadership, livelihood leadership, farming leadership, media leadership, development leadership, agribusiness leadership, global leadership, technology leadership, corporate sustainability, lifetime achievements, policy leadership, programme leadership, etc. The theme for the summit was ‘Connecting Farmers with Markets and Technologies’.